Mahmoud Ahmadinejad (Persian: محمود احمدی‌نژاد‎, translit. Mahmūd Ahmadinezhād [mæhmuːd(-e) æhmædiːneʒɒːd] ( listen),[b] born Mahmoud Sabbaghian (Persian: صباغیان‎, translit. Sabbāghyān) on 28 October 1956) is an Iranian politician and statesman who served as the sixth President of Iran from 2005 to 2013. He was also the main political leader of the Alliance of Builders of Islamic Iran, a coalition of conservative political groups in the country. An engineer and teacher from a poor background, ideologically shaped by thinkers such as Navvab Safavi, Jalal Al-e-Ahmad and Ahmad Fardid, Ahmadinejad joined the Office for Strengthening Unity after the Iranian Revolution. Appointed a provincial governor, he was removed after the election of President Mohammad Khatami and returned to teaching. Tehran's council elected him mayor in 2003. He took a religious hard line, reversing reforms of previous moderate mayors. His 2005 presidential campaign, supported by the Alliance of Builders of Islamic Iran, garnered 62% of the runoff election votes, and he became President on 3 August 2005. During his presidency, Ahmadinejad was a controversial figure within Iran, as well as internationally. He has been criticized domestically for his economic policies and disregard for human rights. Internationally, he is criticized for his hostility towards countries including Israel, Saudi Arabia, the United Kingdom, and the United States and other Western and Arab states. In 2007, Ahmadinejad introduced a gas rationing plan to reduce the country's fuel consumption, and cut the interest rates that private and public banking facilities could charge. He supports Iran's nuclear program. His election to a second term in 2009 was widely disputed and caused widespread protests domestically and drew significant international criticism. During his second term, Ahmadinejad came under fire not only from reformers but also traditionalists in parliament and the Revolutionary Guard, and even from Supreme Leader Ali Khamenei, over accusations of corruption, Ahmadinejad's dismissal of Intelligence minister Gholam-Hossein Mohseni-Eje'i, and his support for his controversial close adviser Esfandiar Rahim Mashaei. On 14 March 2012, Ahmadinejad became the first president of the Islamic Republic of Iran to be summoned by the Islamic Consultative Assembly (parliament) to answer questions regarding his presidency. Limited to two terms under the current Iranian constitution, Ahmadinejad supported Esfandiar Rahim Mashaei's campaign for president. On 15 June 2013, Hassan Rouhani was elected as Ahmadinejad's successor and assumed office on 3 August 2013. Mahmoud Ahmadinejad was born on 28 October 1956 near Garmsar, in the village of Aradan, in Semnan province. His mother, Khanom, was a Sayyida, an honorific title given to those believed to be direct bloodline descendants of the Islamic prophet Muhammad. His father, Ahmad, was a grocer and barber, and was a religious Shia who taught the Quran. When Mahmoud was one year old, his family moved to Tehran. Mahmoud's father changed their family name from "Saborjhian" or "Sabaghian"[c] to Ahmadinejad in 1960 to avoid discrimination when the family moved to the city. Sabor is Persian for thread painter,[d] a once common occupation within the Semnan carpet industry. Ahmadinejad's uncle and his brother Davoud Ahmadinejad have confirmed that the previous surname was "Sabbaghian" (Persian: صباغیان‎). Ahmadinejad is a composite name: Ahmadi Nejad. Ahmad was his father's name. The suffix Nejad in Persian means race, therefore the term Ahmadi Nejad means "the lineage of Ahmad". According to the interviews with the relatives of Ahmadi Nejad, his father who works in a small shop, sold his house in Tehran and bought a smaller one, giving the leftover to charity and poor people. In 1976, Ahmadinejad took Iran's national university entrance examination. According to his autobiography, he was ranked 132nd out of 400,000 participants that year, and soon enrolled in the Iran University of Science and Technology (IUST), located at Tehran, as an undergraduate student of civil engineering. He would later earn his doctorate in 1997 in transportation engineering and planning from Iran University of Science and Technology as well, when he was the mayor of Ardabil Province, located at the north-west of the country. Some details of Ahmadinejad's life during the 1980s are not publicly known, but it is known that he held a number of administrative posts in the province of West Azerbaijan, Iran. Many reports say that after Saddam Hussein ordered the invasion of Iran, Ahmadinejad joined the Islamic Revolutionary Guard Corps and served in their intelligence and security apparatus, but his advisor Mojtaba Samareh Hashemi has said: "He has never been a member or an official member of the Revolutionary Guards", having been a Basiji-like volunteer instead. After the Islamic Revolution, Ahmadinejad became a member of the Office for Strengthening Unity, an organization developed to prevent students from sympathizing or allying with the emerging militant Mojahedin-e Khalq organisation. Ahmadinejad first assumed political office as unelected governor to both Maku and Khoy in West Azarbaijan Province during the 1980s. He eventually became an advisor to the governor general of Kurdistan Province for two years. During his doctoral studies at Tehran, he was appointed governor general of newly formed Ardabil Province from 1993 until Mohammad Khatami removed him in 1997, whereupon he returned to teaching. The 2003 mayoral race in Tehran elected conservative candidates from the Alliance of Builders of Islamic Iran to the City Council of Tehran. The Council appointed Ahmadinejad mayor. After his election to the presidency, Ahmadinejad's resignation as the Mayor of Tehran was accepted on 28 June 2005. After two years as mayor, Ahmadinejad was one of 65 finalists for World Mayor in 2005, selected from 550 nominees, only nine of them from Asia. He was among three strong candidates for the top-ten list, but his resignation made him ineligible. Ahmadinejad was not particularly well known when he entered the presidential election campaign as he had never run for office before, (he had been mayor of Tehran for only two years and had been appointed, not elected),:315 although he had already made his mark in Tehran for rolling back earlier reforms. He was/is a member of the Central Council of the Islamic Society of Engineers, but his key political support is inside the Alliance of Builders of Islamic Iran (Abadgaran or Developers). He was also helped by support from supreme leader Ali Khamenei, who some described Ahmadinejad as a "protege" of. Ahmadinejad was largely non-committal about his plans for his presidency, perhaps to attract both religious conservatives and the lower economic classes. His campaign slogan was: "It's possible and we can do it". In the campaign, he took a populist approach. He emphasized his own modest life, and compared himself with Mohammad Ali Rajai, Iran's second president. Ahmadinejad said he planned to create an "exemplary government for the people of the world" in Iran. He was a "principlist", acting politically based on Islamic and revolutionary principles. One of his goals was "putting the petroleum income on people's tables", meaning Iran's oil profits would be distributed among the poor. Ahmadinejad was the only presidential candidate who spoke out against future relations with the United States. He told Islamic Republic of Iran Broadcasting the United Nations was "one-sided, stacked against the world of Islam." He opposed the veto power of the UN Security Council's five permanent members: "It is not just for a few states to sit and veto global approvals. Should such a privilege continue to exist, the Muslim world with a population of nearly 1.5 billion should be extended the same privilege." He defended Iran's nuclear program and accused "a few arrogant powers" of trying to limit Iran's industrial and technological development in this and other fields. In his second-round campaign, he said, "We didn't participate in the revolution for turn-by-turn government. ... This revolution tries to reach a world-wide government." He spoke of an extended program using trade to improve foreign relations, and called for greater ties with Iran's neighbours and ending visa requirements between states in the region, saying that "people should visit anywhere they wish freely. People should have freedom in their pilgrimages and tours." Ahmadinejad described Ayatollah Mohammad Taghi Mesbah Yazdi, a senior cleric from Qom, as his ideological and spiritual mentor. Mesbah founded the Haghani School of thought in Iran. He and his team strongly supported Ahmadinejad's 2005 presidential campaign. Ahmadinejad won 62% of the vote in the run-off poll against Akbar Hashemi Rafsanjani. Supreme Leader Ayatollah Khamenei authorized his presidency on 3 August 2005. Ahmedinejad kissed Khamenei's hand during the ceremony to show his loyalty. Shortly after Ahmadinejad was elected president, some Western media outlets published claims that he was among the students who stormed the US embassy in Tehran, sparking the Iran hostage crisis. This claim has been denied by the Iranian government, the Iranian opposition, as well as a CIA investigation on the matter. Iran's President is constitutionally obliged to obtain confirmation from the parliament for his selection of ministers. Ahmadinejad presented a short-list at a private meeting on 5 August, and his final list on 14 August. The Majlis rejected all of his cabinet candidates for the oil portfolio and objected to the appointment of his allies in senior government office. The Majlis approved a cabinet on 24 August. The ministers promised to meet frequently outside Tehran and held their first meeting on 25 August in Mashhad, with four empty seats for the unapproved nominees. Ahmadinejad's team lost the 2006 city council elections. In the first nationwide election since Ahmadinejad became President, his allies failed to dominate election returns for the Assembly of Experts and local councils. Results, with a turnout of about 60%, suggested a voter shift toward more moderate policies. According to an editorial in the Kargozaran independent daily newspaper, "The results show that voters have learned from the past and concluded that we need to support.. moderate figures." An Iranian political analyst said that "this is a blow for Ahmadinejad and Mesbah Yazdi's list." On 23 August 2008, Supreme Leader Ali Khamenei announced that he "sees Ahmadinejad as president in the next five years," a comment interpreted as indicating support for Ahmadinejad's reelection. 39,165,191 ballots were cast in the election on 12 June 2009, according to Iran's election headquarters. Ahmadinejad won 24,527,516 votes, (62.63%). In second place, Mir-Hossein Mousavi, won 13,216,411 (33.75%) of the votes. The election results remained in dispute with both Mousavi and Ahmadinejad and their respective supporters who believe that electoral fraud occurred during the election. Supreme Leader Ayatollah Ali Khamenei formally endorsed Ahmadinejad as President on 3 August 2009, and Ahmadinejad was sworn in for a second term on 5 August 2009. Iran's Constitution stipulates term limits of two terms for the office of President. Several Iranian political figures appeared to avoid the ceremony. Former presidents Mohammad Khatami, and Akbar Hashemi Rafsanjani, who was then head of the Expediency Discernment Council, along with opposition leader Mir Hossein Mousavi, did not attend the ceremony. Opposition groups asked protesters on reformist websites and blogs to launch new street demonstrations on the day of the inauguration ceremony. On inauguration day, hundreds of riot police met opposition protesters outside parliament. After taking the oath of office, which was broadcast live on Iranian state television, Ahmadinejad said that he would "protect the official faith, the system of the Islamic revolution and the constitution." France, Germany, the United Kingdom and the United States announced that they would not send the usual letters of congratulation. Ahmadinejad announced controversial ministerial appointments for his second term. Esfandiar Rahim Mashaei was briefly appointed as first vice president, but opposed by a number of Majlis members and by the intelligence minister, Gholam-Hossein Mohseni-Eje'i. Mashaei followed orders to resign. Ahmadinejad then appointed Mashaei as chief of staff, and fired Mohseni-Eje'i. On 26 July 2009, Ahmadinejad's government faced a legal problem after he sacked four ministers. Iran's constitution (Article 136) stipulates that, if more than half of its members are replaced, the cabinet may not meet or act before the Majlis approves the revised membership. The vice chairman of the Majlis announced that no cabinet meetings or decisions would be legal, pending such a re-approval. Ahmadinejad suffered a defeat in March/May 2012 parliamentary elections with Ayatollah Khamenei's "Principalist" allies winning about three quarters of the parliaments 290 seats, and Ahmadinejad supporters far fewer. In Ahmadinejad's first four years as president, Iran's real GDP reflected growth of the economy. Inflation and unemployment also decreased under Ahmadinejad due to better economic management and ending the unsustainable spending and borrowing patterns of previous administrations . Ahmadinejad increased spending by 25% and supported subsidies for food and petrol. He also initially refused a gradual increase of petrol prices, saying that after making necessary preparations, such as a development of public transportation system, the government would free up petrol prices after five years. Interest rates were cut by presidential decree to below the inflation rate. One unintended effect of this stimulation of the economy has been the bidding up of some urban real estate prices by two or three times their pre-Ahmadinejad value by Iranians seeking to invest surplus cash and finding few other safe opportunities. The resulting increase in the cost of housing hurt poorer, non-property owning Iranians, the putative beneficiaries of Ahmadinejad's populist policies. The Management and Planning Organisation, a state body charged with mapping out long-term economic and budget strategy, was broken up and its experienced managers were fired. In June 2006, 50 Iranian economists wrote a letter to Ahmadinejad that criticized his price interventions to stabilize prices of goods, cement, government services, and his decree issued by the High Labor Council and the Ministry of Labor that proposed an increase of workers' salaries by 40%. Ahmadinejad publicly responded harshly to the letter and denounced the accusations. Ahmadinejad called for "middle-of-the-road" compromises with respect to Western-oriented capitalism and socialism. Current political conflicts with the United States caused the central bank to fear increased capital flight due to global isolation. These factors prevented an improvement of infrastructure and capital influx, despite high economic potential. Among those that did not vote for him in the first election, only 3.5% said they would consider voting for him in the next election. Mohammad Khoshchehreh, a member of the Iranian parliament that campaigned for Ahmadinejad, said that his government "has been strong on populist slogans, but weak on achievement." President Ahmadinejad changed almost all of his economic ministers, including oil, industry and economy, since coming to power in 2005. In an interview with Fars News Agency on April 2008, Davoud Danesh Jaafari who acted as minister of economy in Ahmadinejad's cabinet, harshly criticized his economic policy: "During my time, there was no positive attitude towards previous experiences or experienced people and there was no plan for the future. Peripheral issues which were not of dire importance to the nation were given priority. Most of the scientific economic concepts like the effect of liquidity on inflation were put in question." In response to these criticisms, Ahmadinejad accused his minister of not being "a man of justice" and declared that the solution to Iran's economic problem is "the culture of martyrdom". In May 2008, the petroleum minister of Iran admitted that the government illegally invested 2 billion dollars to import petrol in 2007. At Iranian parliament, he also mentioned that he simply followed the president's order. While his government had 275 thousand billion toman oil income, the highest in Iranian history, Ahmadinejad's government had the highest budget deficit since the Iranian revolution. During his presidency, Ahmadinejad launched a gasoline rationing plan to reduce the country's fuel consumption. He also instituted cuts in the interest rates that private and public banking facilities could charge. He issued a directive that the Management and Planning Organization be affiliated to the government. In May 2011, Ahmadinejad announced that he would temporarily run the Oil Ministry. In October 2006, Ahmadinejad began calling for the scrapping of Iran's existing birth-control policies which discouraged Iranian couples from having more than two children. He told MPs that Iran could cope with 50 million more people than the current 70 million. In November 2010, he urged Iranians to marry and reproduce earlier: "We should take the age of marriage for boys to 20 and for girls to about 16 and 17." His remarks have drawn criticism and been called ill-judged at a time when Iran was struggling with surging inflation and rising unemployment, estimated at around 11%. Ahmadinejad's call was reminiscent of a call for Iranians to have more children made by Ayatollah Ruhollah Khomeini in 1979. The policy had increased Iran's population by 16 million in seven years:321 but had eventually been reversed in response to the resultant economic strain. In 2008, the government sent the "Family Protection Bill" to the Iranian parliament. Women's rights activists criticized the bill for removing protections from women, such as the requirement that a husband obtain his wife's consent before marrying a second wife. Women's rights in Iran are more religiously based than those in secular countries. The first legislation to emerge from his newly formed government was a 12 trillion rial (US$1.3 billion) fund called "Reza's Compassion Fund", named after Shi'a Imam Ali al-Rida. Ahmadinejad's government said this fund would tap Iran's oil revenues to help young people get jobs, afford marriage, and buy their own homes. The fund also sought charitable donations, with a board of trustees in each of Iran's 30 provinces. The legislation was a response to the cost of urban housing, which is pushing up the national average marital age (currently around 25 years for women and 28 years for men). In 2006 the Iranian parliament rejected the fund. However, Ahmadinejad ordered the administrative council to execute the plan. According to a report by Human Rights Watch, "Since President Ahmadinejad came to power, treatment of detainees has worsened in Evin Prison as well as in detention centers operated clandestinely by the Judiciary, the Ministry of Information, and the Islamic Revolutionary Guard Corps. ":464 Human Rights Watch also has stated, "Respect for basic human rights in Iran, especially freedom of expression and assembly, deteriorated in 2006. The government routinely tortures and mistreats detained dissidents, including through prolonged solitary confinement. ":463 Human Rights Watch described the source of human rights violations in contemporary Iran as coming from the Judiciary, accountable to Ali Khamenei, and from members directly appointed by Ahmadinejad. In April 2007, the Tehran police, which is under Khamenei's supervision, began a crackdown on women with "improper hijab." This led to criticism from associates of Ahmadinejad. In 2006, Ahmadinejad's government applied a 50% quota for male students and 50% for female students in the university entrance exam for medicine, dentistry and pharmacy. The plan was supposed to stop the growing presence of female students in the universities. In a response to critics, Iranian minister of health and medical education, Kamran Bagheri Lankarani argued that there are not enough facilities such as dormitories for female students. Masoud Salehi, president of Zahedan University said that presence of women generates some problems with transportation. Also, Ebrahim Mekaniki, president of Babol University of Medical Sciences, stated that an increase in the presence of women will make it difficult to distribute facilities in a suitable manner. Bagher Larijani, the president of Tehran University of Medical Sciences made similar remarks. According to Rooz Online, the quotas lack a legal foundation and are justified as support for "family" and "religion." In December 2006, it was reported that some students were angry about the International Conference to Review the Global Vision of the Holocaust, which they saw as promoting Holocaust denial. In response to the students' slogans, the president said: "We have been standing up to dictatorship so that no one will dare to establish dictatorship in a millennium even in the name of freedom. Given the scars inflicted on the Iranian nation by agents of the US and British dictatorship, no one will ever dare to initiate the rise of a dictator." It was reported that even though the protesters broke the TV cameras and threw hand-made bombs at Ahmadinejad, the president asked the officials not to question or disturb the protesters. In his blog, Ahmadinejad described his reaction to the incident as "a feeling of joy" because of the freedom that people enjoyed after the revolution. One thousand students also protested the day before to denounce the increased pressure on the reformist groups at the university. One week prior, more than two thousand students protested at Tehran University on the country's annual student day, with speakers saying that there had been a crackdown on dissent at universities since Ahmadinejad was elected. Ahmadinejad has been a vocal supporter of Iran's nuclear program, and has insisted that it is for peaceful purposes. He has repeatedly emphasized that building a nuclear bomb is not the policy of his government. He has said that such a policy is "illegal and against our religion." He also added at a January 2006 conference in Tehran that a nation with "culture, logic and civilization" would not need nuclear weapons, and that countries that seek nuclear weapons are those that want to solve all problems by the use of force. In a 2008 interview Ahmadinejad elaborated that countries striving to obtain nuclear weapons are not politically progressive nations and those who possess them and continually make new generations of such bombs are "even more backward". In April 2006, Ahmadinejad announced that Iran had successfully refined uranium to a stage suitable for the nuclear fuel cycle. In a speech to students and academics in Mashhad, he was quoted as saying that Iran's conditions had changed completely as it had become a nuclear state and could talk to other states from that stand. On 13 April 2006, Iran's news agency, Islamic Republic News Agency (IRNA), quoted Ahmadinejad as saying that the peaceful Iranian nuclear technology would not pose a threat to any party because "we want peace and stability and we will not cause injustice to anyone and at the same time we will not submit to injustice." Nevertheless, Iran's nuclear policy under Ahmadinejad's administration received much criticism, spearheaded by the United States and Israel. The accusations include that Iran is striving to obtain nuclear arms and developing long-range firing capabilities—and that Ahmadinejad issued an order to keep UN inspectors from freely visiting the nation's nuclear facilities and viewing their designs, in defiance of an IAEA resolution. Following a May 2009 test launch of a long-range missile, Ahmadinejad was quoted as telling the crowd that with its nuclear program, Iran was sending the West a message that "the Islamic Republic of Iran is running the show." Despite Ahmadinejad's vocal support for the program, the office of the Iranian president is not directly responsible for nuclear policy. It is instead set by the Supreme National Security Council. The council includes two representatives appointed by the Supreme Leader, military officials, and members of the executive, judicial, and legislative branches of government, and reports directly to Supreme Leader Ali Khamenei, who issued a fatwa against nuclear weapons in 2005. Khamenei has criticized Ahmadinejad's "personalization" of the nuclear issue. Ahmadinejad vowed in February 2008 that Iran will not be held back from developing its peaceful nuclear program and has stated that at least 16 different peaceful uses for nuclear technology have so far been identified. Ahmadinejad has stressed the importance of the right to peaceful nuclear development. Iranian opposition leader, Mousavi, has even stated that giving up the country's nuclear program would be "irreparable" and that the Iranian people support the nuclear program. "No one in Iran will accept suspension," Mousavi has said, adding that if elected, his policy would be to work to provide "guarantees" that Tehran's nuclear activities would never divert to non-peaceful aims. In October 2009, the United States, France, and Russia proposed a U.N.-drafted deal with Iran regarding its nuclear program, in an effort to find a compromise between Iran's stated need for a nuclear reactor and the concerns of those who are worried that Iran harbors a secret intent of developing a nuclear weapon. After some delay in responding, on 29 October, Ahmadinejad seemed to change his tone towards the deal. "We welcome fuel exchange, nuclear co-operation, building of power plants and reactors and we are ready to co-operate," he said in a live broadcast on state television. He added that Iran would not retreat "one iota" on its right to a sovereign nuclear program. According to Brussels-based NGO International Crisis Group, Ahmadinejad has been criticized for attacking private "plunderers" and "corrupt officials," while engaging in "cronyism and political favouritism". Many of his close associates were appointed to positions for which they have no obvious qualifications, and "billion dollar no-bid contracts" were awarded to the Islamic Revolutionary Guard Corps (IRGC), an organization with which he is strongly associated. According to Najmeh Bozorgmehr of the Financial Times, "Iran has a long history of cronyism and corruption under its monarchies and the Islamic Republic. But the scale of corruption under Mr. Ahmadinejad was of a different order, according to both reform-minded and conservative politicians." In June 2007, Ahmadinejad was criticized by some Iranian parliament members over his remark about Christianity and Judaism. According to Aftab News Agency, Ahmadinejad stated: "In the world, there are deviations from the right path: Christianity and Judaism. Dollars have been devoted to the propagation of these deviations. There are also false claims that these [religions] will save mankind. But Islam is the only religion that [can] save mankind." Some members of Iranian parliament criticized these remarks as being fuels to religious war. There are two statements that led to criticism from some religious authorities. One concerns his speech at the United Nations, and the other concerns the attendance of women at football matches. During a visit to group of Ayatollahs in Qom after returning from his 2005 speech to the UN General Assembly, Ahmadinejad stated he had "felt a halo over his head" during his speech and that a hidden presence had mesmerized the unblinking audience of foreign leaders, foreign ministers, and ambassadors. Ahmedinejad closed his speech with a call for the "mighty Lord" to "hasten the emergence" of Imam Mahdi. According to Iranian-American journalist Hooman Majd, the response given to Ahmedinejad at the assembly was offensive to the conservative religious leaders because an ordinary man cannot presume a special closeness to God or any of the Imams, nor can he imply the presence of the Mahdi. 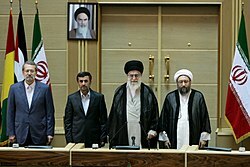 In 2008, a serious conflict emerged between the Iranian President and the head of parliament over three laws approved by the Iranian parliament: "the agreement for civil and criminal legal cooperation between Iran and Kyrgyzstan", "the agreement to support mutual investment between Iran and Kuwait", and "the law for registration of industrial designs and trademarks". The conflict was so serious that the Iranian leader stepped in to resolve it. Ahmadinejad wrote a letter to the parliamentary speaker Gholam-Ali Haddad-Adel, furiously denouncing him for the "inexplicable act" of bypassing the presidency by giving the order to implement legislation in an official newspaper. Ahmadinejad accused the head of parliament of violating Iranian constitutional law. He called for legal action against the parliament speaker. Haddad-Adel responded to Ahmadinejad accusing him of using inappropriate language in his remarks and letters. In August 2008, Ahmadinejad appointed Ali Kordan as interior minister. Kordan's appointment was heavily criticized by Iranian parliamentarians, media and analysts after it came to light that a doctoral degree purportedly awarded to Kordan was fabricated, and that the putative issuer of the degree, Oxford University, had no record of Kordan receiving any degree from the University. It was also revealed that he had been jailed in 1978 for moral charges. In November 2008, Ahmadinejad announced that he was against impeachment of Kordan by Iranian parliament. He refused to attend the parliament on the impeachment day. Kordan was expelled from office by Iranian parliament on 4 November 2008. 188 MPs voted against him. An impeachment of Kordan would push Ahmadinejad close to having to submit his entire cabinet for review by parliament, which was led by one of his chief political opponents. Iran's constitution requires that step if more than half the cabinet ministers are replaced, and Ahmadinejad replaced nine of 21 until that date. In February 2009, after Supreme Audit Court of Iran reported that $1.058 billion of surplus oil revenue in the (2006–2007) budget hadn't been returned by the government to the national treasury, Ali Larijani, Iran's parliamentary speaker, called for further investigations to make sure the missing funds are returned to the treasury as soon as possible. Tensions between Larijani and Ahmadinejad continued into 2013. Ahmadinejad criticized the National Audit Office for what he called its "carelessness", saying the report "incites the people" against the government. The head of the parliament energy commission, Hamidreza Katouzian, reported "The government spent $5 billion to import fuel, about $2 billion more than the sum parliament had authorized." Katouzian quoted Iran's Oil Minister, Gholam-Hossein Nozari, as saying that President Ahmadinejad had ordered the extra purchase. In May 2011, several members of parliament threatened to initiate impeachment proceedings against Ahmadinejad after his merger of eight government ministries and the firing of three ministers without parliament's consent. According to the Majles news website, MP Mohammad Reza Bahonar stated, "legal purging starts with questions, which lead to warnings and end with impeachment." On 25 May, parliament voted to investigate another allegation, that Ahmadinejad had committed election irregularities by giving cash to up to nine million Iranians before the 2009 presidential elections. The vote came within hours after the allegations appeared in several popular conservative news sites associated with supreme leader Ali Khamenei, suggesting the supreme leader supported the investigation. The disputes were seen as part of the clash between Ahmadinejad and other conservatives and former supporters, including supreme leader Khamenei, over what the conservatives see as Ahmadinejad's confrontational policies and abuse of power. Early in his presidency, Ahmadinejad was sometimes described as "enjoy[ing] the full backing" of the Supreme Leader Ali Khamenei, and even as being his "protege." In Ahmadinejad's 2005 inauguration the supreme leader allowed Ahmadinejad to kiss his hand and cheeks in what was called "a sign of closeness and loyalty," and after the 2009 election fully endorsed Ahmadinejad against protesters. However, as early as January 2008 signs of disagreement between the two men developed over domestic policies, and by the period of 2010–11 several sources detected a "growing rift" between them. The disagreement was described as centered on Esfandiar Rahim Mashaei, a top adviser and close confidant of Ahmadinejad and opponent of "greater involvement of clerics in politics", who was first vice president of Iran until being ordered to resign from the cabinet by the supreme leader. In 2009, Ahmadinejad dismissed Intelligence Minister Gholam-Hossein Mohseni-Eje'i, an opponent of Mashaei. In April 2011, another Intelligence minister, Heydar Moslehi, resigned after being asked to by Ahmadinejad, but was reinstated by the supreme leader within hours. Ahmadinejad declined to officially back Moslehi's reinstatement for two weeks and in protest engaged in an "11-day walkout" of cabinet meetings, religious ceremonies, and other official functions. Ahmadinejad's actions led to angry public attacks by clerics, parliamentarians and military commanders, who accused him of ignoring orders from the supreme leader. Conservative opponents in parliament launched an "impeachment drive" against him, four websites with ties to Ahmadinejad reportedly were "filtered and blocked", and several people "said to be close" to the president and Mashaei (such as Abbas Amirifar and Mohammed Sharif Malekzadeh) were arrested on charges of being "magicians" and invoking djinns. On 6 May 2011, it was reported that Ahmadinejad had been given an ultimatum to accept the leader's intervention or resign, and on 8 May he "apparently bowed" to the reinstatement, welcoming back Moslehi to a cabinet meeting. The events have been said to have "humiliated and weakened" Ahmadinejad, though the president denied that there had been any rift between the two, and according to the semiofficial Fars News Agency, he stated that his relationship with the supreme leader "is that of a father and a son." In 2012, Khamenei ordered a halt to a parliamentary inquiry into Ahmadinejad's mishandling of the Iranian economy. In 2016, Khamenei advised Mahmoud Ahmadinejad, his former ally with whom his relationship was strained after Ahmadinejad accused his son Mojtaba Khamenei of embezzling from the state treasury, to not run for president again. Ahmedinejad was criticised by the religious and political groups in Iran for photographs taken of him embracing Elena Frias de Chavez, the mother of recently deceased Venezuelan president Hugo Chavez, at his funeral. In the image, Ahmedinejad was thought to be holding her hands and in a cheek-to-cheek embrace; such an act, touching an unrelated woman, is considered haraam (forbidden) in some interpretations of Islam. Iranian government officials responded by stating that the image was a fake, then released a second photo showing Ahmadinejad in the same pose, but in this case hugging a man. This later photograph was debunked when it was discovered that the other man was Egyptian opposition leader Mohamed ElBaradei, who had not been at the funeral. One of the most frequent criticisms about Ahmedinejad was the nepotism in his governments. Nepotism was one of his habits in appointing senior government officials. His elder brother, Davoud, was appointed chief inspector at the presidency in 2005 and was in office until 2008. His sister, Parvin, served at the presidential's women's center. His nephew, Ali Akbar Mehrabian, served as the mining and industry minister in his cabinet. His daughter's father-in-law, Esfandiar Rahim Mashaei, served at several senior positions. His brother-in-law, Masoud Zaribafan, served as cabinet secretary. During Ahmadinejad's tenure as President of Iran the foreign policy of the country took a different approach from the previous administration. Relations with developed countries generally soured while relations with less-developed countries, including those in Africa and Latin America, rose. In light of the calls for sanctions on Iran for its nuclear weapons programme, Ahmadinejad and his foreign minister, Manouchehr Mottaki, traveled extensively throughout the two regions, as well as hosted other leaders. Relations with the ALBA states, and Venezuela, Bolivia, and Ecuador, in particular, were most strengthened. Relations with America during the Bush administration and Israel deteriorated further. Ahmadinejad is an outspoken critic of the Western world and is often criticized for his hostility towards the United States, Israel, the United Kingdom and other Western nations. Ahmadinejad abides by Iran's long-standing policy of refusing to recognize Israel as a legitimate state, and wants the Jewish people who immigrated to Israel to return to their "fatherlands" (translated). In 2005, Ahmadinejad, in a speech praising the Iranian Supreme Leader Ayatollah Khomeini, was translated by Iranian state-run media as saying that "Israel must be wiped off the map." A controversy erupted over the translation, with specialists such as Juan Cole of the University of Michigan and Arash Norouzi of the Mossadegh Project pointing out that the original statement in Farsi did not say that Israel should be wiped off the map, but instead that it would collapse. The words 'Israel', 'map', and 'to wipe off' are non-existent in the Iranian speech's original. According to another IRNA translation, on the occasion of a commemoration of the anniversary of Khomeini's death on 3 June 2008, Ahmadinejad stated that "The corrupt element will be wiped off the map." Contextually, Ahmadinejad was quoting Khomeini's words about the imminent disappearance of the Soviet Union and the Shah's regime, and tacked on his remarks concerning Israel. In Katajun Amirpur's analysis, there is no implication in the text that Iran intended destroying Israel or annihilating the Jewish people, any more than Khomeini was suggesting with his words that the Russians, or the Iranian people themselves under the Shah would be extinguished. Ahmadinejad is on the record as stating that Iran had no plans to attack Israel. The statement itself was in fact a citation, with a minute verbal variation, of a remark made by Ayatollah Khomeini in 1979, which had created no furor at the time, but did so when Ahmadinejad quoted them in 2005. Dan Meridor, Israel's minister of intelligence and atomic energy said during an Al Jazeera interview that Ayatollah Ali Khamenei had repeatedly said "that Israel is an unnatural creature, it will not survive. They didn't say, 'We'll wipe it out,' you're right, but, 'It will not survive.'" adding "If Iran says this, and continues to pile up uranium that they enrich, and build missiles in big numbers, and have a nuclear military plan—if you put all this together, you can't say, they don't really mean it." The Washington Post's fact-checker editor Glenn Kessler says the interpretation gets murkier when Ahmadinejad's quote is set against other Iranian propaganda. Karim Sadjadpour, an Iranian specialist at the Carnegie Endowment for International Peace, cites proof that the Iranian government releases propaganda that clearly says Israel should be "wiped off." Joshua Teitelbaum of the Jerusalem Center for Public Affairs discovered pictures of Iranian propaganda banners that clearly say in English: "Israel should be wiped out of the face of the world." In March 2016, Iran tested a ballistic missile painted with the phrase "Israel should be wiped off the Earth" in Hebrew. The missile is reported to be capable of reaching Israel. The Official Web site of the President of Iran quoted Ahmadinejad as saying on 15 May 2011 "The reason for our insistence that the Zionist regime should be wiped out and vanished is that the Zionist regime is the main base for imposing oppression and harbors the main terrorists of the world." He was strongly criticized after claiming that the Jews invented the Holocaust and making other statements influenced by "classic anti-Semitic ideas," which has led to accusations of antisemitism. Ahmedinejad denied that he was an antisemite, saying that he "respects Jews very much" and that he was not "passing judgment" on the Holocaust. 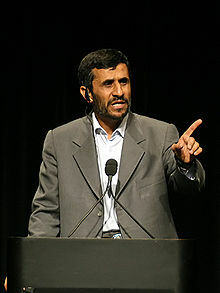 Later, Ahmedinejad claimed that promoting Holocaust denial was a major achievement of his presidency; he stated that "put[ting] it forward at the global level ... broke the spine of the Western capitalist regime". The comments appeared on the Arabic but not on the English version of Fars News Agency's website. He advocates "free elections" for the region, and believes Palestinians need a stronger voice in the region's future. On Quds Day in September 2010 Ahmadinejad criticized the Palestinian Authority over its president's decision to renew direct peace talks with Israel saying the talks are "stillborn" and "doomed to fail", urging the Palestinians to continue armed resistance to Israel. He said that Mahmoud Abbas had no authority to negotiate on behalf of the Palestinians. Nabil Abu Rudeineh, a spokesman for the Palestinian Authority, fired back, saying, Ahmadinejad "does not represent the Iranian people, ..., is not entitled to talk about Palestine, or the President of Palestine"
Establishing an independent and impartial committee of investigation, which would determine the roots and causes of the regrettable event of 9/11, is the demand of all the peoples of the region and the world. ... Any opposition to this legal and human demand means that 9/11 was premeditated in order to achieve the goals of occupation and of confrontation with the nations. Ahmadinejad is said to have "forged a close public friendship" with Venezuelan president Hugo Chavez. On Chavez's death in March 2013, Ahmadinejad posted a condolence message on his website stating, "I have no doubt that he [Chavez] will return alongside Jesus Christ and Mahdi to establish peace and justice in the world". Ahmedinejad left his office at Pasteur st. on 3 August 2013 and returned to his private house in Narmak. In an interview with CNN, Ahmadinejad said that, after the end of his presidency, he would return to the university and retire from politics. However, Ahmadinejad announced from Russia on the sidelines of an OPEC summit on 2 July 2013 that he might stay involved with politics by creating a new party or non-governmental organization. In late July, Mehr news agency reported that Ahmadinejad obtained permission from the Supreme Cultural Revolution Council to launch a university for post-graduate studies in Tehran. On 5 August 2013, the Supreme Leader Ali Khamenei issued a decree appointing Ahmedinejad as a member of the Expediency Council. On 15 June 2015, a number of Ahmadinejad's cabinet ministers established a new political party, called YEKTA Front. The party published list for 2016 legislative election and some of Ahmadinejad's cabinet members (like Hamid-Reza Haji Babaee, Sadeq Khalilian, Mohammad Abbasi and Mahmoud Bahmani) registered for the election, but Ahmadinejad did not support any list in the election. It was rumored that Ahmadinejad would run for presidency again in 2017 after he did not deny plans when questioned by the media in 2015. Ahmadinejad remained mostly out of the public eye since leaving office, but his anti-Western rhetoric and combative style remained popular among many Iranian Principlists, and he was widely viewed as among the most formidable political figures capable of unseating Hassan Rouhani. In December 2015, it was reported that he had begun his presidential campaign by appointing his campaign's chiefs. He also began provincial travels in April 2016 by traveling to Amol. Travels were continued until September 2016, when he traveled to Gorgan. Ahmadinejad's advisors said his travels were not electoral and he only delivered speeches due to public demand. In September 2016, it was rumored that Ahmadinejad had asked Ali Khamenei, Supreme Leader of Iran, for permission to run for the office and was rejected by Khamenei, who said that it was not in the best interests of Iran. On 26 September 2016, Ayatollah Khamenei confirmed the news, stated that it was only advice, not an order. It was the first time since Khamenei's election as Supreme Leader in 1989 that he advised a person to not run for election. Formerly, some candidates had asked him for advice (former president Akbar Hashemi Rafsanjani for his campaign in 2005 and 2013), but Khamenei chose to not give his opinion on those occasions. The following day, Ahmadinejad officially announced he will not run in the upcoming 2017 presidential election. He later supported Hamid Baghaei's candidacy. However, Ahmadinejad registered as presidential candidate on 12 April 2017. He was disqualified by the Guardian Council on 20 April 2017, making him the second person after Akbar Hashemi Rafsanjani to be barred from running the office for a third term. Ahmadinejad has been an active and prominent member of the right-wing Islamic Society of Engineers since its establishment until 2005. As of 2014, he is still a member of the party but is not active since 2005. He was also a founding member of the Society of Devotees of the Islamic Revolution, but left in 2011. Since 2005, Ahmadinejad has introduced himself as non-partisan, even anti-party and did not try to gain support of political parties despite being supported by the conservative camp. A National Democratic Institute report published in 2009 states that Ahmadinejad is self-described "Principlist". Ahmadinejad is known for his vulgarism, undiplomatic language and usage of slang terms. He is active on Twitter, where he engages his followers primarily in English and tweets about sports, the United States, and current events. According to a poll conducted by Information and Public Opinion Solutions LLC (iPOS) in March 2016, Ahmadinejad is the least popular political figure in Iran, while he has 57% approval and 39% disapproval ratings, thus a +18% net popularity. Supporters of Ahmadinejad consider him a simple man who leads a modest life. As president, he wanted to continue living in the same house in Tehran his family had been living in until his security advisers insisted that he should move. Ahmadinejad had the antique Persian carpets in the Presidential palace sent to a carpet museum, and opted instead to use inexpensive carpets. He is said to have refused the VIP seat on the Presidential plane, and that he eventually replaced it with a cargo plane instead. Upon gaining Iran's presidency, Ahmadinejad held his first cabinet meeting in the Imam Reza shrine at Mashhad, an act perceived as "pious". He also used to lay an extra place for the 12th Imam at his weekly cabinet briefings. ^ Smith, Matt (16 May 2011). "Ahmadinejad losing ground in Iran power struggle, analysts say". CNN. Retrieved 3 June 2016. ^ Milani, Abbas (3 August 2009). "Inside The Civil War That's Threatening The Iranian Regime". The New Republic. Retrieved 3 June 2016. ^ a b c "داستان داوود و محمود: داوود احمدی‌نژاد چرا عليه محمود احمدس‌نژاد سخنرانی می‌كند؟" [The Story of Davoud and Mahmoud: Why Davoud Ahmadinejad Speaks Against Mahmoud Ahmadinejad?]. Aseman Weekly (in Persian) (7). 19 November 2011. Archived from the original on 20 August 2013. Retrieved 11 July 2016. ^ Lucas, Scott (5 January 2015). "Iran Feature: Signs of an Ahmadinejad Comeback & a Hard-Line Challenge to Speaker of Parliament Larijani". EA WorldView. Retrieved 3 June 2016. ^ a b Peterson, Scott (2010). Let the Swords Encircle Me: Iran: A Journey Behind the Headlines. Simon and Schuster. pp. 279–280. ISBN 978-1416597391. ^ Afshon Ostovar (2016). Vanguard of the Imam: Religion, Politics, and Iran's Revolutionary Guards. Oxford University Press. p. 124. ISBN 978-0190491703. ^ "Mahmoud Ahmedinejad on Facebook". Facebook. 24 July 2001. Archived from the original on 17 December 2012. Retrieved 27 July 2009. ^ a b c "Mahmoud Ahmadinejad". Iran Chamber Society. Retrieved 28 July 2009. ^ a b c Lee, Jon (7 January 2009). "Can Iran Change? High stakes in Mahmoud Ahmadinejad's reelection campaign". New Yorker. Retrieved 18 June 2011. ^ a b c d e f g Pike, John. "President Mahmoud Ahmadinejad". Global Security. Retrieved 18 June 2011. ^ a b "Ahamd Bozorgian (MP): 'The Separation of men and women's elevators is an advantageous policy. It would help to grow.'". Archived from the original on 14 January 2006. Retrieved 2005-06-20. CS1 maint: BOT: original-url status unknown (link) Entekhab News. Retrieved 31 August 2006. ^ a b "Ahmadinejad Sworn in as Iran's New President". Voice Of America. 6 August 2005. Archived from the original on 2009-01-29. Retrieved 23 December 2008. ^ a b "Iran hardliner becomes president". BBC. 3 August 2005. Retrieved 6 December 2006. ^ a b Tait, Robert (25 May 2007). "Iran interest rate cut sparks panic selling". The Guardian. Tehran. Retrieved 18 June 2011. ^ "Assembly of Experts to study economic reform plan: Rafsanjani". Tehran Times (in Persian). 23 August 2008. Archived from the original on 2008-09-12. Retrieved 23 August 2008. ^ "Iran clerics defy election ruling". BBC News. 5 July 2009. Retrieved 18 June 2011. ^ "Is this government legitimate?". BBC. 7 September 2009. Retrieved 18 June 2011. ^ Landry, Carole (25 June 2009). "G8 calls on Iran to halt election violence". Retrieved 18 June 2011. ^ a b Erdbrink, Thomas (3 April 2013). "Power Struggle Is Gripping Iran Ahead of June Election". New York Times. Retrieved 4 April 2013. ^ a b c d Dehghan, Saeed Kamali (5 May 2011). "Ahmadinejad allies charged with sorcery". The Guardian. London. Archived from the original on 10 May 2011. Retrieved 18 June 2011. ^ a b c d Dareini, Ali Akbar (20 April 2011). "Iranian lawmakers warn Ahmadinejad to accept intelligence chief as political feud deepens". StAlbertGazette.com. Associated Press. Archived from the original on 17 December 2013. Retrieved 11 January 2017. ^ "Iran's president Mahmoud Ahmadinejad summoned to parliament". The Guardian. 14 March 2012. Retrieved 18 December 2012. ^ Ahmadinejad critic Larijani re-elected Iran speaker. BBC (5 June 2012). Retrieved on 18 December 2012. ^ a b "Hard-Line Ex-Leader Ahmadinejad Stuns Iran With Election Bid". The New York Times. 12 April 2017. ^ "Mahmoud Ahmadinejad 'disqualified' from Iran elections". 20 April 2017. ^ "Iran's Ahmadinejad disqualified from running for the president". 20 April 2017. ^ a b Melman, Yossi; Javedanfar, Meir (2007). The Nuclear Sphinx of Tehran: Mahmoud Ahmadinejad and the State of Iran. Basic Books. pp. 1–3. ISBN 9780786718870. ^ Tait, Robert (2 July 2005). "A humble beginning helped to form Iran's new hard man". The Guardian. Tehran. Retrieved 27 July 2009. ^ Naji, Kasra (2008). Ahmadinejad: The Secret History of Iran's Radical Leader. University of California Press. p. 4. ISBN 9781845116361. ^ "Mahmoud Ahmadinejad revealed to have Jewish past". Daily Telegraph. 3 October 2009. ^ "Ahmadinejad has no Jewish roots". The Guardian. 5 October 2009. Retrieved 10 January 2017. ^ Enteshami, Anoushiravan; Zweiri, Mahjoob (2007). Iran and the rise of Neoconservatives, the politics of Tehran's silent Revolution. I. B. Tauris. p. 53. ^ "Iran's president launches weblog". BBC. 14 August 2006. Retrieved 28 July 2009. ^ Bozorgmehr, Najmeh (30 May 2008). "Interview transcript: Mojtaba Samareh-Hashemi". Financial Times. Retrieved 28 July 2009. ^ a b c Hassan, Hussein D. (16 January 2007). "Profile and Statements of President Mahmoud Ahmadinejad" (PDF). Library of Congress. Archived from the original (PDF) on 6 January 2010. Retrieved 28 July 2009. ^ a b "The 2005 World Mayor finalists". World Mayor. Retrieved 18 June 2011. ^ a b Wright, Robin (2008). Dreams and Shadows: The Future of the Middle East. Penguin Press. ISBN 9781101202760. ^ Aneja, Atul (2006). He was also known as tir khalas zan before becoming president. "New Dynamics". Archived from the original on 16 October 2007. Retrieved 2010-02-05. CS1 maint: BOT: original-url status unknown (link) Frontline. Retrieved 28 July 2007. ^ Dehghan, Saeed Kamali; Borger, Julian (19 May 2011). "Ahmadinejad's enemies scent blood in Iran power struggle". The Guardian. ^ Vick, Karl (19 June 2005). "Hard-Line Figure In Iran Runoff". The Washington Post. Retrieved 28 July 2009. ^ a b Tunisia, Babnet (2005). "More on Mahmoud Ahmadinejad". Persian Mirror. Archived from the original on 26 June 2009. Retrieved 2 August 2009. ^ a b Moubayed, S. (19 January 2006). "Iran and the art of crisis management". Asia Times. Retrieved 28 July 2009. ^ Brea, Jennifer. "Profile: Mahmoud Ahmadinejad, President of Iran." Archived 7 July 2011 at the Wayback Machine. Retrieved 31 August 2006. ^ Ansari, Nazenin (25 June 2006). "Divide and empower". Prospect Magazine. Archived from the original on 2008-12-07. Retrieved 2 August 2009. ^ Slackman, Michael (8 September 2006). "Behind Ahmadinejad, a Powerful Cleric". The New York Times. Retrieved 11 January 2017. ^ "Clip DrIman CNN – at Tofoiran". 6 September 2006. Archived from the original on 15 July 2011. Retrieved 18 June 2011. ^ "New Iran interior chief approved". BBC News. 18 November 2008. Retrieved 21 June 2009. ^ "Article 133". Constitution of Islamic Republic of Iran. International Constitutional Law. 1992. Retrieved 2 August 2009. ^ "Ahmadinejad's cabinet declared". Archived from the original on 11 January 2006. Retrieved 2009-06-10. Presidency of the Islamic Republic of Iran. Retrieved 18 October 2006. ^ "Depleted Iran cabinet meets after rejection of four by parliament". Khaleej Times Online. 26 August 2005. Archived from the original on 8 June 2011. Retrieved 2 August 2009. ^ a b Blair, Edmund (18 December 2006). "Results in Iranian Vote Seen as Setback for Ahmadinejad". The Washington Post. Retrieved 18 June 2011. ^ Mansharof, Y.; Savyon, A. (26 December 2008). "Renewed Power Struggle in Iran as the Presidential Elections Approach: Part I – Ahmadinejad's Revolutionary-Messianic Faction vs. Rafsanjani–Reformist Alliance". The Middle East Media Research Institute. Retrieved 11 January 2017. ^ "Ahmadinejad 'leads in Iran election'". BBC. 13 June 2009. Retrieved 13 June 2009. ^ a b c "Defiant Iran president takes oath". BBC. 5 August 2009. Retrieved 5 August 2009. ^ "Iran The Presidency". Photius.com. Retrieved 18 June 2011. ^ "Iran poll critics shun ceremony". BBC. 3 August 2009. Retrieved 5 August 2009. ^ "Iran's opposition calls for inauguration protests". Google News. Associated Press. 4 August 2009. Retrieved 5 August 2009. ^ Daragahi, Borzou; Mostaghim, Ramin (27 July 2009). "Iran president clashes with conservatives". Los Angeles Times. Retrieved 18 June 2011. ^ Deshmukh, Jay (26 July 2009). "Ahmadinejad 'sacks four Iran ministers'". Google. Retrieved 7 September 2010. ^ "آفتاب – باهنر: جلسات دولت نهم از این پس غیرقانونی است". Aftab News. Retrieved 7 September 2010. ^ "Ahmadinejad unveils new cabinet". PressTV. Archived from the original on 18 September 2012. Retrieved 18 June 2011. ^ "Iran backs first woman minister". BBC. 3 September 2009. Retrieved 28 November 2009. ^ MacFarquhar, Neil (4 March 2012). "Elections in Iran Favor Ayatollah's Allies, Dealing Blow to President and His Office". The New York Times. ^ a b "Iran's unemployment falls to 10.3 pct -minister". Reuters. 31 March 2008. Retrieved 18 June 2011. ^ "Iran approves plan to lop three zeros off Rial". Presstv. Archived from the original on 17 December 2013. Retrieved 18 June 2011. ^ Bakhtiar, Abbas. "Ahmadinejad's Achilles Heel"
^ Secor, Laura (2 February 2009). "Letter from Tehran, The rationalist". The New Yorker. p. 31. ^ "Economics is for donkeys". New Statesman. 11 September 2008. Retrieved 21 June 2009. ^ "Iranian economists lash out at Ahmadinejad's policies". Daily Star. Libya. 16 June 2006. Retrieved 18 June 2011. ^ Lynch, David J. (5 September 2006). "Geopolitics casts pall on hobbled Iranian economy". USA Today. Tehran. Retrieved 26 January 2008. ^ Sanati, Kimia. "Ahmadinejad held to election promises". Asia Times. Retrieved 1 February 2008. ^ Dareini, Ali Akbar (17 January 2007). "Iran's Discontent With Ahmadinejad Grows". The Washington Post. Associated Press. Retrieved 28 August 2007. ^ "Ahmadinejad slammed by outgoing economy minister". AFP. 22 April 2008. Retrieved 21 June 2009. ^ "Martyrdom would solve Iran's economic woes: Ahmadinejad". AFP. 24 April 2008. Retrieved 21 June 2009. ^ Leyne, Jon (24 October 2008). "Iran economy facing 'perfect storm'". BBC. Retrieved 21 June 2009. ^ "Assembly of Experts to study economic reform plan: Rafsanjani". Tehran Times. 23 August 2008. Archived from the original on 12 September 2008. Retrieved 23 August 2008. ^ "Iran: Debate heats up over restructuring of Management and Planning Organization". Payvand. 18 October 2006. Retrieved 27 April 2009. ^ "Iran's leader taking over Oil Ministry temporarily, news agency says". CNN. 16 May 2011. ^ Peterson, Scott (22 November 2010). "Ahmadinejad calls on Iranian girls to marry at 16". The Christian Science Monitor. ^ Tait, Robert (23 October 2006). "Ahmadinejad urges Iranian baby boom to challenge West". The Guardian. Tehran. Retrieved 11 January 2017. ^ "Ebadi protests against Iran's polygamy bill". Hindustan Times. 2008-08-04. Retrieved 21 June 2009. ^ a b ""Reza's Compassion Fund" project archived". Rooz (in Persian). Archived from the original on 21 October 2006. Retrieved 17 October 2006. ^ "Video of Imam Reza Love Fund". IranNegah.com. Archived from the original on 6 March 2012. Retrieved 18 May 2008. ^ a b Human Rights Watch (2011). World Report 2007: Events of 2006. Seven Stories Press. ISBN 9781583229583. ^ a b "گزارش اختصاصي رجانيوز از حاشيه هاي مراسم امروز دانشگاه اميركبير" [Exclusive report from the margins of today's ceremony Amir Kabir University]. Rajanews.com (in Persian). 7 March 2008. Archived from the original on 7 March 2008. Retrieved 11 January 2017. ^ a b "مشروح سخنان بسيار مهم احمدي نژاد در دانشگاه اميركبير" [Detailed critical remarks of Ahmadinejad at Amir Kabir University] (in Persian). Archived from the original on 7 March 2008. Retrieved 11 January 2017. ^ Fathi, Nazila (12 December 2006). "Students disrupt speech by Iran chief". Deseret News. Tehran. The New York Times News Service. Retrieved 12 December 2006. ^ "انتقاد مشاور رئيس‌جمهور از طرح مبارزه با بدحجابي" [Ahmadinejad's adviser criticizes hijab enforcement issue]. Baztab.com (in Persian). Archived from the original on 7 December 2008. Retrieved 23 April 2007. ^ Vahdat, Ahmad (18 January 2012). "HIV created by West to enfeeble third world, claims Mahmoud Ahmadinejad". The Daily Telegraph. London. Retrieved 19 January 2012. ^ "Mahmoud Ahmadinejad on homosexualty". YouTube. CNN. Retrieved 14 April 2017. ^ Park, James (24 September 2012). "President Ahmadinejad: Gays are ugly and are like thieves". pinknews.co.uk. Retrieved 28 September 2012. ^ "neYous Social Headline News Aggregator". Neyous.com. Archived from the original on 19 October 2010. Retrieved 2010-09-07. ^ "Protest against the second cultural revolution". Archived from the original on 21 October 2006. Retrieved 2006-10-21. Rooz. Retrieved 18 October 2006. ^ "Khoshchehreh (MP) protests against the unwanted retirement of university professors". Archived from the original on 24 February 2012. Retrieved 2012-12-02. Aftab News. Retrieved 18 October 2006. ^ "Different aspects of the unwanted retirement of university professors". Archived from the original on 4 October 2006. Retrieved 2012-12-02. Aftab News. Retrieved 18 October 2006. ^ "صدور حکم بازنشستگی برای ۵۳ استاد دانشگاه علم و صنعت، ادوار نيوز" Gooya. Retrieved 26 January 2008. ^ a b Theodoulou, Michael. "Protesters condemn Holocaust conference". The Scotsman. Retrieved 2016-02-01. ^ "President: Students are pioneers of revolutionary movements – Irna". Archived from the original on 2007-09-29. ^ "Films of yesterday protest in Iran are leaking out « Connections پیوست". Peyvast.blog.com. 2006-12-12. Archived from the original on 13 September 2007. Retrieved 2009-06-21. ^ "Freedom and Liberty". Ahmadinejad's English Blog. Archived from the original on 2013-04-30. ^ Fathi, Nazila (12 December 2006). "Students disrupt speech by Iran chief". Deseret News. New York Times News Service. ^ "Ahamadinejad: We will reach the nuclear energy in near future." BBC News. Retrieved 29 October 2006. ^ "Excerpts: Ahmadinejad conference." BBC News. Retrieved 29 October 2006. ^ a b Goodman, Amy; Gonzalez, Juan (26 September 2008). "Ahmadinejad: Nukes for not politically progressive states". Press TV. Archived from the original on 26 September 2008. Retrieved 26 September 2008. ^ "Ahmadinejad: Iran can now talk to world from vantage point of a nuclear state". ArabicNews.com. Archived from the original on 22 April 2006. Retrieved 29 October 2006. ^ "Ahmadinejad: Iran nuke right non-negotiable". UPI. 13 April 2006. Retrieved 12 June 2006. ^ Ravid, Barak (12 June 2011). "Sources: UN watchdog hiding evidence on Iran nuclear program". Haaretz. Retrieved 18 June 2011. ^ Dareini, Ali Akbar (6 February 2006). "Nuclear Inspections Are Curbed by Iran". The Washington Post. Tehran. Associated Press. Retrieved 11 January 2017. ^ "Iran's Nuclear Program". The New York Times. ^ "Mahmoud Ahmadinejad: 'Nuclear Issue of Iran Is Now Closed'". Fox News. Associated Press. Retrieved 11 January 2017. ^ Sanger, David E.; Fathimay, Nazila (20 May 2009). "Iran Test-Fires Missile With 1,200-Mile Range". The New York Times. Retrieved 11 January 2017. ^ Recknagel, Charles (27 June 2005). "Iran: Election Of Ahmadinejad Unlikely To Affect Nuclear Negotiations". Radio Free Europe. Retrieved 11 January 2017. ^ "Iran rebukes its prez over N-policy". The Times of India. 19 January 2007. Retrieved 26 January 2008. ^ "Ahmadinejad: Nations jealous of nuclear progress". CNN. 11 February 2008. Retrieved 11 January 2017. ^ "Mousavi: Iran will never halt enrichment". PressTV. 14 April 2009. Archived from the original on 17 April 2009. Retrieved 1 July 2009. ^ "Iran 'ready for nuclear agreement' – Middle East". Al Jazeera. 29 October 2009. Retrieved 7 September 2010. ^ "Iran proposes big changes to draft atom deal: report". Reuters. 29 October 2009. ^ "Iran: Ahmadi-Nejad's Tumultuous Presidency". International Crisis Group. 6 February 2007. Archived from the original on 9 July 2008. Retrieved 21 June 2009. ^ "Iran: Rogue trader". Financial Times. 5 June 2014. Retrieved 20 March 2015. ^ "Iran's President Threatens Crackdown on Christianity". Archived from the original on 4 May 2008. Retrieved 2010-02-05. CBN News. Retrieved 27 January 2008. ^ دفاع از اظهارات احمدی‌نژاد عليه مسيحيت و يهود، آفتاب (in Persian). Gooya. 7 June 2007. Archived from the original on 19 June 2007. Retrieved 31 May 2009. ^ Harrison, Frances. "Iran police move into fashion business". Retrieved 16 April 2007. ^ "روزنامه هاشمي": بوسه‌ احمدی‌نژاد بر دست معلم سالخورده‌اش، اشكال شرعي دارد!" Ansar News. Retrieved 27 January 2008. ^ "Ahmadinejad accused of indecency" BBC News. Retrieved 28 January 2008. ^ Bruno, Greg (11 July 2008). "The Iranian political structure". Iran Times International. Washington DC. Retrieved 3 August 2013. ^ a b Majd, Hooman (2008). The Ayatollah Begs to Differ: The Paradox of Modern Iran. Doubleday. p. 79. ISBN 978-0767928014. ^ "Iran President Ahmadinejad In Rows With 3 Leading Officials". Newsmax.com. Tehran: Agence France Presse. 23 April 2008. Retrieved 21 June 2009. ^ "Ahmadinejad Attacks Haddad Adel". Iran-Press-Service.com. April 2008. Retrieved 21 June 2009. ^ "Haddad-Adel: Constitution not violated". PressTV. 23 April 2008. Archived from the original on 7 December 2008. Retrieved 21 June 2009. ^ "Statement: Mr Ali Kordan". The University of Oxford. 15 August 2008. Archived from the original on 17 August 2008. Retrieved 17 August 2008. ^ "سوابق اخلاقي". Rooz online. 14 August 2008. Archived from the original on 22 August 2008. Retrieved 14 August 2008. ^ "News". Africasia. Archived from the original on 7 December 2008. Retrieved 21 June 2009. ^ Erdbrink, Thomas (4 November 2008). "Scandal, Fistfight Erupt Over Impeachment Move in Iran". The Washington Post. Retrieved 21 June 2009. ^ "Iran minister sacked over forgery". BBC News. 4 November 2008. Retrieved 21 June 2009. ^ "Iran examines missing oil revenue". United Press International. 16 February 2009. Retrieved 23 February 2009. ^ "Iran looks into missing $1B oil money". PressTV. 5 February 2009. Archived from the original on 11 February 2009. Retrieved 23 February 2009. ^ "Oil Money Report Rejected". Iran newspaper. 21 February 2009. Retrieved 23 February 2009. ^ "Majlis searching for $1B missing oil money". PressTV. 15 February 2009. Archived from the original on 8 March 2012. Retrieved 23 February 2009. ^ a b Ghajar, Shayan (25 May 2011). "Is Ahmadinejad on His Way Out?". InsideIran.org. Archived from the original on 25 July 2011. Retrieved 11 January 2017. ^ Erdbrink, Thomas (15 May 2011). "Ayatollah: Iran's president 'bewitched' by senior aide". The Washington Post. Retrieved 11 January 2017. ^ a b Fathi, Nazila (7 January 2008). "Ahmadinejad loses favor with Khamenei, Iran's top leader". The New York Times. Archived from the original on 29 June 2011. Retrieved 18 June 2011. ^ a b c Abdo, Geneive (26 April 2011). "Clash Over Mashaei Reveals Fissures Within the Iranian Regime". The Huffington Post. Retrieved 11 January 2017. ^ a b c Daragahi, Borzou (2 May 2011). "Spy flap weakens Iranian President Mahmoud Ahmadinejad". Los Angeles Times. Beirut. Retrieved 11 January 2017. ^ a b Peterson, Scott (9 May 2011). "Iran's Ahmadinejad survives worst storm of his presidency". The Christian Science Monitor. Retrieved 11 January 2017. ^ Dehghan, Saeed Kamali (6 May 2011). "Iran's supreme leader tells Ahmadinejad: accept minister or quit". The Guardian. ^ Erdbrink, Thomas (8 May 2011). "Iran's Ahmadinejad affirms Khamenei decision, tensions remain". The Washington Post. ^ "Iran calls off Ahmadinejad parliament probe". Al Jazeera. 21 November 2012. Retrieved 11 January 2017. ^ "Khamenei puts stop to Ahmadinejad's return". 27 September 2016. ^ "Iran's Ayatollah Khamenei blocks Ahmadinejad's comeback". Irish Times. ^ Dehghan, Saeed Kamali (28 September 2016). "Ahmadinejad blocked from running in Iran presidential elections". The Guardian – via The Guardian. ^ "Ahmadinejad Prohibited to Run for President ... based on Khamenei's Orders". Asharq Al-awsat. 27 September 2016. Archived from the original on 18 October 2016. Retrieved 1 April 2017. ^ "Ahmadinejad vows to follow Khamenei's order not to run". ^ National Post Staff and The Associated Press (11 March 2013). "'Lost control:' Iran's Ahmadinejad under fire from conservative critics for picture of him consoling Hugo Chavez's mother". National Post. Retrieved 11 January 2017. ^ "NBC News, Ahmadinejad's scandalous moment with Hugo Chavez's mother". 11 March 2013. Archived from the original on 14 March 2013. Retrieved 17 March 2013. ^ a b "Ahmadinejad's hug and the future of Chavez's alliance". CNN. 13 March 2013. Retrieved 17 March 2013. ^ a b c "Ahmadinejad's 'Family Justice'". Radio Free Europe. 8 June 2009. Retrieved 28 July 2013. ^ Williams, Carol J. (15 July 2013). "Iran president-elect hints at need for nuclear sanctions relief". Los Angeles Times. Retrieved 28 July 2013. ^ a b Rubin, Michael; Alfoneh, Ali (10 May 2009). "Iran Presidential Election Round Up". National Review. Retrieved 28 July 2013. ^ a b Hannun, Marya (14 May 2013). "Wait, Mahmoud Ahmadinejad's brother is running for president of Iran?". Foreign Policy. Retrieved 28 July 2013. ^ Molavi, Reza; Gandolfo, K. Luisa (Winter 2010). "Who Rules Iran?". The Middle East Quarterly. XVII (1): 61–68. Retrieved 14 August 2013. ^ "Ahmadinejad blames West for AIDS". The Jerusalem Post. Associated Press. 29 July 2008. ^ "Iran president says UN sanctions unlikely". CNN. 24 April 2006. ^ "Ahmadinejad: Israel must be wiped off the map", IRIB News, 26 October 2005. ^ Nazeela, Fathi (27 October 2005). "Iran's New President Says Israel 'Must Be Wiped Off the Map'". The New York Times. ^ "Iran leader's comments attacked". BBC. 2005-10-27. Retrieved 2015-07-22. ^ Kessler, Glenn (5 October 2011). "Did Ahmadinejad really say Israel should be 'wiped off the map'?". Washington Post. Retrieved 2015-07-22. ^ Friedman, Uri (2011-10-05). "Debating Every Last Word of Ahmadinejad's 'Wipe Israel Off the Map'". The Wire. Retrieved 2015-07-22. ^ Steele, Jonathan (14 June 2006). "Lost in translation". The Guardian. ^ a b c Amirpur, Katajun (2012). "Iran's Policy towards Jewish Iranians and the State of Israel. Is the Present Iranian State Islamofascist?". Die Welt des Islams. 52 (3/4): 387. doi:10.1163/15700607-201200a6. ^ Hooglund, Eric (2013). "Decoding Ahmadinejad's rhetoric on Israel". In Hooglund, Eric; Stenberg, Leif. Navigating Contemporary Iran: Challenging Economic, Social and Political Perceptions. Routledge. pp. 198–206. ^ "Meridor: Ahmadinejad didn't say, 'Wipe Israel off the map'". Israel Hayom. 17 April 2012. ^ "Israeli Minister Agrees Ahmadinejad Never Said Israel 'Must Be Wiped Off the Map'". The New York Times. 17 April 2012. ^ "Did Ahmadinejad really say Israel should be 'wiped off the map'?". The Washington Post. 4 October 2011. ^ "Reports: Iran fires missile marked with 'Israel should be wiped'". USA Today. 9 March 2016. ^ Gladstone, Rick (14 March 2016). "Israel Calls on U.N. to Punish Iran for Missile Tests". The New York Times. ^ Case, Spencer (26 September 2016). "Unthinking the Thinkable: Iran and the Bomb". National Review. ^ "Iran tests missile capable of reaching Israel". CBS News. Associated Press. 9 May 2016. Retrieved 11 January 2017. ^ "President Calls Zionist Main Terrorist Hub in World". Archived from the original on 22 July 2015. Retrieved 2015-02-26. CS1 maint: BOT: original-url status unknown (link) Access date 2016-07-30. Both this link and the corresponding Farsi page have been removed from the official web site of the Iranian President. The Farsi original has not been re-discovered. "Holocaust comments spark outrage", BBC News, Retrieved 14 December 2005. "Iran leader's comments attacked", BBC News, Retrieved 27 January 2008. Esfandiari, Golnaz. "Iran: President's Latest Comments About Israel Spark Further Condemnation". Radio Free Europe. Retrieved 28 January 2008. Vick, Karl; Jordan, Mary (28 October 2005). "World Leaders Condemn Iranian's Call to Wipe Israel 'Off the Map'". Washington Post. Retrieved 11 January 2017. 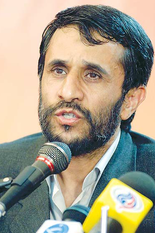 "NCC Condemns Ahmadinejad's Holocaust Statement". National Council of Churches. Retrieved 16 December 2007. Slackman, Michael. "In Tehran, a riposte to the Danish cartoons". The New York Times. Retrieved 24 September 2007. "Germans Protest Against Ahmadinejad, Racism As Cup Opens". Deutsche Welle, Retrieved 11 June 2006. "Annan: 'Dismay' over Iranian comments on Israel". CNN. Retrieved 27 September 2007. Fathi, Nazila. "Text of Mahmoud Ahmadinejad's Speech". The New York Times. Retrieved 17 October 2006. "Iran vote seen as referendum on Ahmadinejad". The Boston Globe. Retrieved 27 December 2006. Bronner, Ethan (10 June 2006). "Just How Far Did They Go, Those Words Against Israel?". The New York Times. Retrieved 11 June 2006. "Ahmadinejad misunderstood, says Iran" Archived 30 September 2007 at the Wayback Machine. The Daily Times of Pakistan. Retrieved 22 February 2006. ^ "Diplomats walk out as Ahmadinejad rails against Israel in UN". Haaretz. 2009-09-24. Harding, Luke; Campbell, Denis (10 June 2006). "Iran team face mass protest". The Guardian. Retrieved 11 June 2007. "Eurovision may ban Israeli entry due to lyrics on nuclear war". Haaretz. Associated Press. 1 March 2007. Retrieved 11 January 2017. "Iran's Rhetoric on Holocaust Anger German Muslims", Deutsche Welle. Retrieved 18 February 2007. Smith-Spark, Laura. "Racism fears dog World Cup build-up". BBC News. Retrieved 26 May 2006. "Annan condemns Holocaust denial". BBC News. Retrieved 27 January 2006. Erlanger, Steven (13 January 2006). "Israel Wants West to Deal More Urgently With Iran". The New York Times. Tel Aviv. Retrieved 28 March 2008. "NCC Condemns Ahmadinejad's Holocaust Statement", National Council of Churches. Retrieved 16 December 2005. ^ Namiech, Ophelie (2009-10-02). "How a nice Jewish girl met Iranian madman Mahmoud Ahmadinejad". Daily News. New York. Retrieved 2010-09-07. ^ "Ahmadinejad's speech @ Columbia university – a transcript". 25 September 2007. Retrieved 2009-02-02. Davidovitch, Nitza; Dana, Nissim (28 February 2017). "The Holocaust paradox: Holocaust denial and its use in the Arab world". Israel Affairs. 23 (2): 411–426. doi:10.1080/13537121.2016.1274507. ISSN 1353-7121. Jewish Telegraph Agency, staff (8 July 2013). "Ahmadinejad says Holocaust denial was his major achievement". Times of Israel. Retrieved 3 September 2018. Winograd, Zoe (9 July 2013). "Ahmadinejad: my main achievement was Holocaust denial". The Jewish Chronicle. Retrieved 3 September 2018. Rubin, Michael (19 January 2015). "Iran to Host Holocaust Cartoon Contest - Commentary Magazine". Commentary Magazine. Retrieved 3 September 2018. ^ Fathi, Naila (15 January 2006). "UN Scrutiny Won't Make Iran Quit Nuclear Effort, President Says". The New York Times. Retrieved 11 January 2017. ^ Black, Ian (3 September 2010). "Middle East peace talks are 'doomed to fail', says Ahmadinejad". The Guardian. Retrieved 11 January 2017. ^ Iran's Ahmadinejad calls on Palestinians to fight on. Reuters. Retrieved on 2011-02-03. ^ Bowen, Jeremy (2010-09-03). "Mid-East talks doomed, says Iranian leader Ahmadinejad". Bbc.co.uk. Retrieved 2011-06-18. ^ Video: Ahmadinejad pours scorn on Middle East peace talks. Telegraph (2010-09-03). Retrieved on 2011-02-03. ^ CNN Wire Staff (5 September 2010). "Iran continues back-and-forth barbs with Palestinians over peace talks". CNN. Retrieved 11 January 2017. ^ Lyons, John (6 September 2010). "Progress of Middle East peace talks 'a surprise'". The Australian. Retrieved 11 January 2017. ^ "YouTube: Full speech by Mahmoud Ahmadinejad at UN". Russia Today. 23 September 2010. Retrieved 24 September 2010. ^ O'Brien, Michael (2010-09-24). "Iranian leader wants 'fact-finding mission' into causes of 9/11 attacks". The Hill. Retrieved 23 February 2013. ^ "Barack Obama condemns Mahmoud Ahmadinejad's UN speech". BBC. 2010-09-25. Retrieved 24 September 2010. ^ "In Beirut, Iranian President Ahmadinejad Reiterates 9/11 Conspiracy, Accuses the West in Al-Hariri Assassination". The Middle East Media Research Institute. Special Dispatch No. 3304. 18 October 2010. Archived from the original on 29 June 2011. ^ Cohen, Dudi (25 June 2011). "Iranian president questions Holocaust, 9/11". Ynetnews.com. Retrieved 25 June 2011. ^ Hanrahan, Mark (2011-09-28). "Al Qaeda Calls On Mahmoud Ahmadinejad To End 'Ridiculous' 9/11 Conspiracy Theories". Huffington Post. Retrieved 2011-11-21. ^ Bezhan, Frud (March 6, 2013). "Ahmadinejad Predicts Chavez Will Return Alongside Jesus, Hidden Imam". Radio Free Europe Radio Liberty. Retrieved 7 March 2013. ^ Nasseri, Ladane (29 July 2013). "Iran's Ahmadinejad to Set Up University After Exit From Office". Bloomberg. Retrieved 29 July 2013. ^ "Ahmadinejad in new appointment". Albawaba. Tehran. FNA. 5 August 2013. Retrieved 5 August 2013. ^ News, پایگاه خبری تحلیلی فردا. "سفرهای انتخاباتی احمدی‌نژاد به ایستگاه آخر رسید". fardanews.com. Retrieved 14 January 2017. ^ Bengali, Ramin Mostaghim and Shashank. "Iran's supreme leader tells former president Mahmoud Ahmadinejad not to run again". Retrieved 14 January 2017. ^ "Iran's top leader tells Ahmadinejad not to run for president again". The Washington Post. Retrieved 14 January 2017. ^ "Iran's Supreme Leader Advises Ahmadinejad Not to Run for President". The New York Times. 27 September 2016. Retrieved 14 January 2017. ^ "احمدی‌نژاد از بقایی حمایت کرد". 20 March 2017. ^ "Iran disqualifies Ahmadinejad from bid to regain presidency". The Guardian. 20 April 2017. ^ Faghihi, Rohollah. "The Reincarnation of Mahmoud Ahmadinejad". Foreign Policy. Retrieved 13 October 2018. ^ "Report: Iran Arrests Its Former President for 'Inciting Unrest'". Newsmax. 2018-01-07. Retrieved 2019-04-12. ^ Network, Voltaire. "Ahmadinejad accuses Ayatollah Khamenei of embezzling funds". Voltaire Network. Retrieved 2019-04-12. ^ Asayesh, Hossein; Halim, Adlina Ab. ; Jawan, Jayum A.; Shojaei, Seyedeh Nosrat (March 2011). "Political Party in Islamic Republic of Iran: A Review". Journal of Politics and Law. 4 (1): 221–230. ISSN 1913-9047. ^ ""جامعه اسلامی مهندسین"؛ حزبی که پس از انحلال حزب جمهوری اسلامی ایجاد شد" ["Islamic Society of Engineers", a party established arter dissolution of Islamic Republican Party] (in Persian). Young Journalists Club. 27 March 2014. Retrieved 11 July 2016. ^ Bill Samii (7 November 2005). "Iran: A Rising Star In Party Politics". Radio Free Europe/Radio Liberty. Retrieved 1 March 2017. ^ "جايگزين احمدي نژاد در جمعيت ايثارگران مشخص شد" [Ahmadinejad's replacemebt in Society of Devotees anticipated] (in Persian). Alef. 28 December 2014. Retrieved 11 July 2016. ^ Moghadas, Azam; Ghaffari, Masuod (November 2016). "Civil Society and Democratization in Iran (1979-2009)" (PDF). Asian Journal of Social Sciences & Humanities. 5 (4): 37–44. ISSN 2186-8492. ^ "Iran's Mahmoud Ahmadinejad can't stop responding to tweets today". The Daily Dot. 2018-10-16. Retrieved 2018-10-16. ^ "The curious case of 'woke' Ahmadinejad". The Jerusalem Post | JPost.com. Retrieved 2018-10-16. ^ "ظریف محبوب‌ترین چهره سیاسی ایران". Information and Public Opinion Solutions LLC (in Persian). 24 May 2016. Retrieved 24 May 2016. ^ "Iranian Public Opinion on Key National and International Issues" (PDF). Center for International and Security Studies at Maryland (CISSM) & IranPoll.com. January 2017. Retrieved 4 April 2017. ^ "Bio: Ahmadinejad". JPost. 16 May 2006. Archived from the original on 18 July 2011. Retrieved 18 June 2011. ^ "A loyal liability". The Majalla. 22 December 2010. Retrieved 29 June 2013. ^ "Iran's Ahmadinejad Heckled at University". Newsmax. 12 December 2006. Archived from the original on 6 May 2008. Retrieved 18 June 2011. ^ "Khamenei offers implicit support to Ahmadinejad". AFP. 12 May 2009. Retrieved 7 September 2010. ^ "Africa can Learn from President Mahmoud Ahmadinejad". The African Executive. Archived from the original on 7 July 2011. ^ Escobar, Pepe (15 September 2015). "Travels in Ahmadinejadland". Asia Times. ^ "A modern history of Iran". The Economist. 18 November 2017. Retrieved 18 November 2017. ^ At the time, Revolutionary Guards rejected official ranks for its members and commanders were simply referred to with honorifics such as "brother" or "pasdar" (guard). ^ The -[e] is the Izāfa, which is a grammatical marker linking two words together. It is not indicated in writing, and is not part of the name itself, but is pronounced in Persian language when a first and last name are used together. ^ Kasra Naji says that the name was 'Sabaghian,' which means 'dye-masters' in Persian. ^ In 2009, some media reports claimed that Sabourjian is a common Iranian Jewish name, and that Sabor is the name for the Jewish tallit (prayer shawl) in Persia. Meir Javedanfar, a blogger at The Guardian, disputed this claim, citing experts. "Mahmoud Ahmadinejad collected news and commentary". The Guardian. "Mahmoud Ahmadinejad collected news and commentary". The New York Times.